Mighty B Royal, under jockey Uriel Dominguez, easily winning the $28,500 WHR Open Futurity Sunday afternoon at Sweetwater Downs. ROCK SPRINGS, WY—SEPTEMBER 9, 2018—Mighty B Royal won the $28,500 WHR Open Futurity in an impressive effort on Sunday afternoon at Sweetwater, winning the 350-yard race gate to wire by a length. Uriel Dominguez guided the 2-year-old home in :17.512 to earn a 95 speed index. Post-time favorite Mighty B Royal ($3.60) is a gelded son of Mighty B Valiant. He was bred in Idaho by Dan Moon, out of Howboutaloan, by Royal Shake Em. Ross Brown trains and co-owns Mighty B Royal with Elsha McGarry. Mighty B Royal also won his trial by a length on August 25. This was his fifth lifetime win in seven starts; though he had qualified for three futurities, this was his first stakes win. Hard to Get Out was second to Mighty B Royal in their trial and returned to run second in the final. Cordarelton Ben returned for the mount for trainer Chad Giles. Hard to Get Out was bred in Utah by his owenrs, Jerald and Lacie Davenport. He is a gelded son of Wave Carver, out of the stakes-placed mare Splash Talk, by Splash Bac. This was the first stakes appearance for Hard to Get Out, who broke his maiden last month in Evanston. Sheebe a Banshee and Danny Marshall surged late to gain third place, a neck behind Hard to Get Out. Sheebe a Banshee finished first in her trial but was disqualified and placed fourth; in the start before that, she finished second to Mighty B Royal in an allowance race but was disqualified and placed fifth. Sheebe a Banshee is still a maiden and was making her first stakes appearance in just her fifth lifetime start. Jordan Hadley trains for owner and breeders Shady Stables. 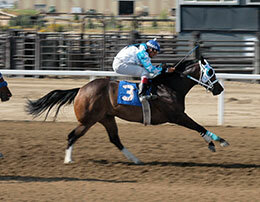 The Utah-bred filly is sired by Sir Runaway Dash and is out of the Chicks a Blazin mare Sheebe a Blazin. Completing the field were Attorney Fees, Keller Knud Teller, Jess Play for Me, Rate Me Hight, Bf Classy James, Mischievous Bay and Mt Fancy Panther.